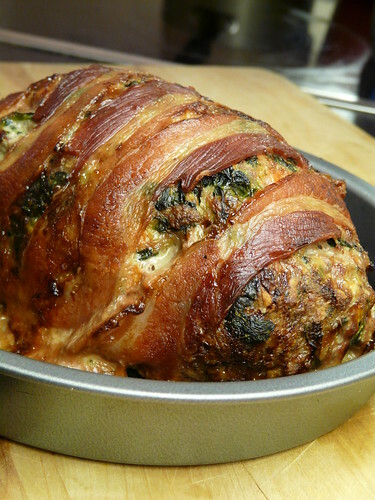 Well, if this is your first meatloaf…it’s a beauty. I make meatloaf a lot. I can see why the name could be confusing. Looks delicious! Meatloaf is rather common in Norway, but I’ve never had anything but the boring store-bought type. Here it’s called meat-pudding. I hated meatloaf as a child, but it’s a staple in our home now. My husband loves it. I don’t put spinach in mine but that’s a great idea. I do put a handful of grated cheese, though.. 🙂 And I actually cook mine in a crockpot sometimes! Very moist that way. Merry Christmas Wendy! My mum made lots of meat loaf when I was little – she would pour a tin of condensed tomato soup over it which I loved. This is part of the reason I have taken to nut roasts as a vegetarian! Have a great christmas wendy – am sure you will feel the absence of your mum but I hope you will also be celebrating with those who are with you and taking marco for some beautiful snowy walks (love your flickr pic) – thinking of you! Looks great! So much better than meat loaf with that yucky tomato sauce on top. So glad you gave it a whirl! Meatloaf really can be raised to culinary heights – as you did here! Meatloaf is really common in Canada. We usually shape it into a rectangular brick, as it cooks more evenly that way. I usually put little bits of bacon and some bbq sauce on top of mine when it’s cooking. For those that can’t eat wheat, a handful of quick cook oats is an excellent substitute. I’m with you, not a common thing in Scotland. I only once attempted it and it was an unmitigated disaster – the poor friend who was over for dinner that night still brings it up when she wants to embarrass me! Yours looks amazing though! I’m American and very familiar with meatloaf, but this one puts all others to shame! Leave it you Wendy! YUM. Will be trying this soon.